Welcome to February – a month where we focus on love, because quite frankly once you get past Ground Hog day (please don’t make your spring plans based on his prediction, #groundhogday) and outside of Valentine’s Day, it’s a pretty bland month. It’s the “middle child” month of winter. Around here, we can have a lot of cold, grey days. BUT, it does only have 28 days. So, what can we do with this month? Create a new habit. As part of building healthy habits, I gave up soda pop for the month. It’s 28 days. I can do this. On day 23, we will have our biometric screening for health insurance so why not purge of whatever stuff is in sodas that’s not good for me. I’ve also committed to maintain at least an 8,000 step-a-day average and start working arm strength exercises. Three W’s — water, walking, and weights. Although I’m not one for getting headaches without it, a daily Coke (#shareacoke) has been my caffeine source. So as to not throw the system into full shock, tea, chocolate, and a little mocha coffee will be my caffeine as needed. These will also prevent any sugar meltdowns. The walking part is easy. On any given day I can do 6,000 steps just with my normal activity. Add regular walking breaks at work and a trip or two to the gym and I’m good with an 8,000 step average. Now for the hard part, weights. This is a little harder to implement because it doesn’t happen within my normal routines. So, I have to make this happen. Every day I have to remember to pick up my hand weights and spend a few minutes lifting and curling. Today is the eighth and so far, I’ve not done well. So, with you for accountability, today I begin this part of the 3-W approach to healthy habits. As Phil poked his head out of the entry, a large gloved hand reached down and swooped him high for the thousands to see. The man was wearing a funny hat. Maybe I’ll get me one of those for next year. The crowd grew silent as they watched the rodent sniff the platform. Would he stay a while and declare a short winter? Or would he see his shadow and scurry back into his hole? Phil gave the people a few minutes of suspense and strongly considered zipping back into his warm, safe cavern. But then something caught his eye. Something no one else would have noticed. Across the park just outside the gathering of fans, who didn’t realize cheering his name would sway him, were three of the cutest female groundhogs Phil had ever laid eyes on. They were chippering amongst themselves. True motivation to stay out for a while and enjoy the scenery. 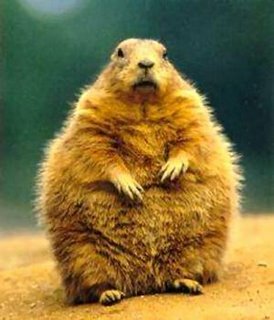 Knowing the three lady friends were watching, Phil stood up on his hind legs and sent them a view of his abs of steel that only female groundhogs could appreciate. The crowd went crazy the man with the tall hat grabbed the microphone and announced his interpretation of Phil’s prediction that spring would in fact come early this year! The band played and the people hugged. Phil took advantage of the distraction and scurried off the platform and hid. Will Phil stay close and meet his three fans? Will his mother ever quit rehashing the groundhog story? Will spring really come early or arrive on March 20th as always? My friend, these are questions I will leave you to ponder.